Tony Norfield has had 20 years experience in City of London financial dealing rooms, for ten years as an executive director and global head of FX strategy in a major European bank. He went on to complete a PhD in economics at SOAS, London. Above all, he is a Marxist. It’s a perfect recipe for an excellent book on modern British imperialism and the features of global finance in the 21st century. In The City, Norfield brings some key insights into understanding the nature of modern financial systems and what role they play in the working (or non-working) of capitalism. Norfield emphasises that finance and production in 21st century capitalism are inseparable – “they are close partners in exploitation”. They always were from the beginnings of industrial capitalism, but it is even more the case now. So the view often expressed in Keynesian and Marxist circles that there is a categorical division between finance and productive capital, where the former is ‘bad’ and the latter is ‘good’, is an error that leads to a misunderstanding of the nature of imperialism and the role of financial centres like the City of London. Another insight that Norfield reveals is the role of British capitalism in imperialism. Britain is second only to the US in the importance of its financial sector globally and in some areas like foreign currency trading it leads (Norfield p71). 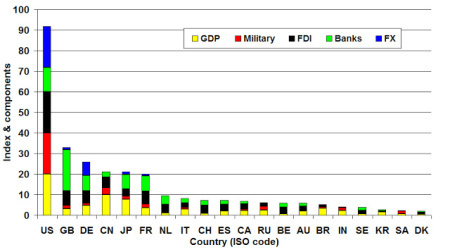 Britain has the second largest stock of foreign direct investment (FDI) of nearly $2trn, equivalent to 30% of UK GDP. Of the top 500 global companies, the UK was second only to the US with 34 companies. The UK had six financial institutions in the top 50, compared to the US with ten. And UK bank assets are four times UK GDP, the highest ratio in the world after Switzerland and tax-haven Luxembourg. The advantages of London as a global financial centre is its central time-zone for financial dealing, the main language of imperialism (English) and the huge back up in professional services, contrasting with the relative weakness of US money markets and banks that have less global reach. British capitalism lost its hegemonic status a hundred years ago but in the post-war period its financial sector has maintained its global status while its manufacturing base diminished. The Eurodollar market in the 1960s and the ‘Big Bang’ of the 1980s, when US banks and foreign banks were allowed to operate without restriction, has preserved the City’s pre-eminence. On p111, Chart 5, Norfield provides an excellent chart that shows the global pecking order for imperialist powers given a range of criteria (GDP, military spending, FDI, bank assets and FX trading). Norfield makes the point that financial privilege is a form of economic power, enabling imperialist countries to draw upon resources and value created elsewhere in the world. For Norfield, the definition of imperialism follows: it’s where a small number of countries dominate world markets through their multi-national corporations, which can be both making things, providing services and financial, or often all three. And he recounts the valuable research of some Swiss engineers on how just 147 companies globally control the world (p113), something I have mentioned before in my blog . Interestingly, the same Swiss researchers have recently published a new report that shows how US and European companies still dominate the levers of financial and corporate power globally, with Asia hardly having a look-in, despite the great Asian ‘production miracle’ of the last 30 years. Finance cannot be divorced from productive capital: it is a feature of the modern world economy. That means just looking at the activities of corporations within the nation state is to miss the real story. As Norfield points out, US corporation revenues from abroad are worth $3bn a day and total more than the annual GDP of Switzerland. A key part of Norfield’s book is to weave in facts like that about modern imperialism with a Marxist analysis of the role of finance capital. He correctly points out that banks can create money (p83) so that money can appear to make money “completely independent of capitalist production” (p85). Money dealing and commercial banking are not ‘parasitic’ as such, because they are necessary to lubricate the wheels of capitalist production. But interest-bearing capital (money to make money) is parasitic as it deducts from the profits of productive capital. And imperialism is interest-bearing capital globalised. Marx connected the phenomenon of money out of money (p90) with his term ‘fictitious capital’: a claim on the value-creating assets of companies and their future earnings. Norfield neatly exposes the inadequacy of Hilferding’s classic Marxist account of finance capital. Hilferding focused rightly on fictitious capital as a key feature of monopoly capitalism or imperialism but he considered the banks as the only levers of financial power, whereas in modern imperialism, there are many other sectors of fictitious capital. And also that the nation state plays a key role in supporting and expanding monopoly capital and imperialist power. One advantage for modern capital accumulation is that bonds, stocks and derivatives are extremely liquid (easy to buy and sell by the second). But as Norfield correctly says, fictitious capital does not break the link between the production of value from labour power or with the value of ‘real’ assets like commodities, plant, equipment etc, it just ‘stretches it’. The expansion of fictitious capital enables capitalism to expand faster but also to crash further. Indeed, the development of modern finance and the expansion of fictitious capital in all its new forms from the 1980s onward was really a response to the fall in the profitability of productive capital in all the major capitalist economies from the mid-1960s to the early 1980s. Norfield holds to Marx’s law of the tendency of the rate of profit to fall as the key underlying factor behind economic crises under capitalism. But he is sceptical of the ability to measure the profitability of capital with official statistics (p 153) and he reckons that measures of national rates of profit can tell us little in this imperialist world. Nevertheless, he attempts to measure US profitability and concludes that there has been a rise from the 1980s and the US rate was “relatively high” by the time of the global financial crash (p155). This would appear to contradict Marx’s law, so Norfield seeks an explanation in the rise in the US rate of profit up to the Great Recession as an indication of a ‘credit-fuelled’ burst that was ‘fictitious’. This explanation has some validity, but I still think it is possible to measure the trend in the profitability of capital in the major economies and for the UK and for the US (and for that matter, for the world). And I think such measures show that the rate of profit peaked in the late 1990s and early 2000s. So Marx’s law holds even without the explanation of fictitious profits. Norfield’s book is incisive in illuminating the nature of the modern British economy. I have described Britain in the past as the world’s largest ‘rentier’ economy. That’s an old-fashioned French word for an economy based on sucking up ‘rents’ through the monopoly ownership of capital (or land) from the profits of the productive sectors. Both the sectors exploit labour but the rentier economy relies on its financial and legal monopoly to take a share of the surplus value appropriated from labour. This gives British capital its important role in modern imperialism, but also its Achilles heel in any global financial crash. British capital is more vulnerable than most in another global crash. One of the consequences of Britain’s rentier economy is its ambiguous relationship with European capital, in particular Franco-German capital and the European Union. British imperialist strategists have looked across the Atlantic to the US for partnership in financial power but also to Europe for trade and investment. The UK is the piggy in the middle between the US and Franco-German Europe. That has now come to a head as British capital considers whether it wants to break with the EU or not, as Europe stutters along in its long depression. What is clear from Norfield’s book is why the City of London is overwhelmingly in favour of the UK staying in the EU and opposing ‘Brexit’. The City depends on the free flows of capital between the ‘capital surplus’ economies of the oil and resource producers (BRICS) and North America’s multi-nationals into and out of Europe. That nexus would be seriously impaired if the UK was outside the EU – especially if the EU were to disintegrate itself in the future. This entry was posted on February 24, 2016 at 1:43 pm and is filed under capitalism, economics, marxism, Profitability. You can follow any responses to this entry through the RSS 2.0 feed. You can leave a response, or trackback from your own site. A very good analysis of how capitalism works. Let me say that I also have my reservations whether we can correctly measure the rate of profit because of the fictitious capital that Tony mentions. I find it funny that the best Marxist analyses come from people that have worked in major European Banks. But I can understand why. One very important point made here is that the market and its supporting infrastructure has allowed the centralization of power and control of the economy. The fictitious money are not only a product of the antagonistic relation of the workers with their employers but a problem that arises because of the Market itself and its infrastructure. That poses a very big question that noone that I know is trying to answer. What kind of structure will the socialist economy use that will prohibit such a centralization from occurring. To answer that question one must first understand the structural reasons of such a centralization today. Those structural reasons should not be simply enumerated because that would not produce an alternative to capitalism. It should be a search for a system that doesn’t have those problems. And this is where Tony’s and most others’ Marxist analyses do not help. A perfect antidote to the kind of garbage we get from Boffy. sounds interesting but christ £20 for a 288 page book. how much of that is fictitious capital? What is the difference in measures? I know Tony N isn’t a fan of the TSSI so does that affect his choice of measurement? Michael, thanks for the review. However, I thought it might be useful to note some other points that bring out what I am arguing in my book. 1. On imperialism: my definition stresses the relationship of the state to monopolistic tendencies in capitalism (p126). So it is not simply the relevant countries concerned, or the corporations based in them, but also the power of their states to set the rules for the global economy, trade, finance, etc. In the case of the US, state power, using the US dollar, is particularly important for giving US corporations benefits and reinforcing their economic privileges. 2. On Hilferding: the analysis in my book is more developed than that in my 2012 AHE paper, to which you gave a link. In brief, Hilferding’s ‘finance capital’ is too narrow a concept, and also a one-sided reflection of German developments. I argue that it is better to develop Marx’s concept of ‘fictitious capital’ (which, essentially means financial securities) to show how this is a means of reflecting and exercising capitalist economic power, especially on a global scale. The ability of the banking system to create credit is another dimension of the way in which ‘finance’ holds sway. The financial system as a whole – both of these – expresses a new version of the old ‘laws of supply and demand’ in the imperialist world economy. I prefer to avoid using the term ‘finance capital’ because of its association with Hilferding’s narrow concept. Regarding Hilferding’s “Finance Capital”, you’re certainly right to historicize the conditions of it’s intellectual production but isn’t it a good start for a study of fictitious capital? I agree that Hilferding’s book is well worth reading, and it was also the first serious discussion of Marx’s concept of fictitious capital. When published, it was widely considered to be the ‘fourth’ volume of Capital. But I think his approach is wrong. His focus on what he saw as the overwhelming power of banks led to his view that state control of banks would allow the capitalist economy to be controlled and regulated. I am looking forward to reading Tony Norfield’s book, especially after reading this review. However, I am also reading John Smit,s book ‘Imperialism in the twenty-five century’s and I find it comprehensive and bold in its analysis of the global economy from a Marxist perspective. I would hope that you would consider reviewing that book sometime soon. Thanks for the review. I hope i can get to read the book someday. Just to clarify on the relation between “productive” and “fictitious” capital: what you’re saying is that the latter is not the overcome of the law of value, but the struggle to overcome the law of value, which yields massive profits but speeds the way to crash. Correct? Michael, shouldn’t there be a link to Tony’s blog in your blogroll? I look forward to some future collaboration between you guys too. I really appreciate the blogs that both of you do. There should – will do. And your site looks very good too. Completely agreed on #2. We need to start over with the concept of fictitious capital. This had the status only of a residual category in “Capital”. There is already a considerable critical literature on Hilferding’s theory that consigns it as a theory of *German capitalism of the Wilhelite and Weimar periods*. My own conjecture is that German finance capital was conditioned by the persistence of the Juncker (ironically the name of the present EU President! ;-D) landlord aristocracy. This in turn should lead us to trace the connection between the accumulated rents of landed property and modern fictitious finance capital, noting that rent rests upon that ultimate fictional commodity, land itself. And this relation is fundamentally the same, regardless of whether a country took Lenin’s “Prussian road” or “American road” with landed property. It certainly has something to do with the USA’s very peculiar history of money and finance – no central bank from 1836 to 1912, etc. However in the long run the relation of finance to landed property may even be more perniciously reactionary in the American case, especially in regards to *urban* landed property. Connection to Donald Trump and Brexit, anyone? Anyway, just ordered your interesting book. Especially intrigued by Chapter 2. It will be relevant to my own studies of the history of US capitalist development, a development that always bore close relation to London finance, yesterday and today.